Can’t Say They Weren’t Warned | Tenleytown, D.C.
Posted on December 9, 2014 by Tenleytown, D.C. If you ever wondered if American University actually monitors whether its contractors are following parking restrictions in the neighborhood, we found some proof they do as we drove by the future home of the Washington College of Law this morning. 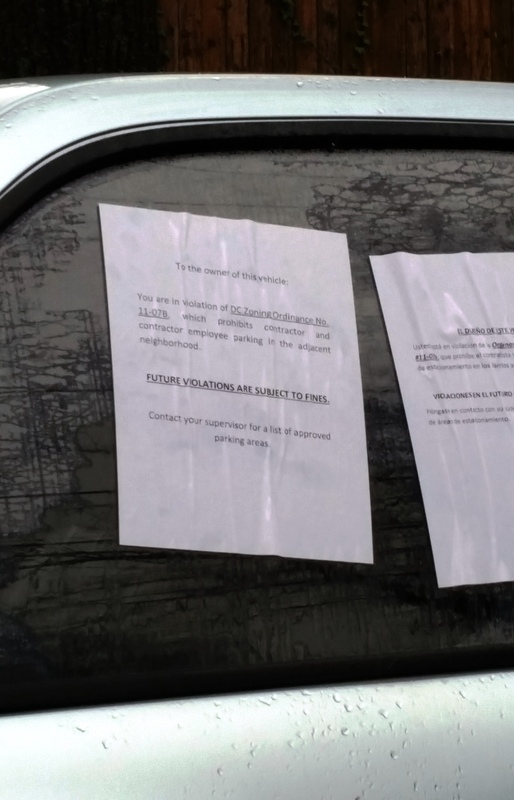 Two vehicles parked on the 4100 block of Warren Street had paper notices plastered to their windshields and driver-side windows alerting their owners that they were in violation of parking regulations. At first we thought some enterprising neighbors had left the warnings, but AU confirmed they were posted by university staff. Given how thorough staff were in leaving notices, which were in English and in Spanish, the vehicle owners certainly can’t say they weren’t warned. The parking restrictions are consistent with the university’s Good Neighbor Policy, which requires all those affiliated with American University to park on campus or in paid parking lots or to take public transportation to campus.